N7 Chest is a Chest Armor in Mass Effect Andromeda. It can be purchased from Merchants or developed from Blueprints via Crafting. "Back in the Milky Way, top combatants in the Systems Alliance military were given an N7 designation. 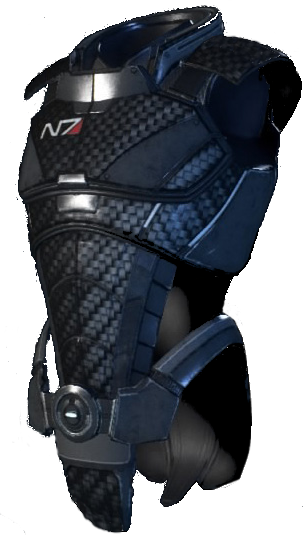 N7 Armor was designed with ablative ceramic plating and kinetic padding to provide most of the hardsuit's proteciton, while sophisticated VIs regulate the user's omni-tool and biotic amps. This particular suit was worn by your father Alec Ryder, who customized it for biotic specialization. It has since been refitted for you personal needs." Can be researched and developed in research centers. Can be purchased from merchants.